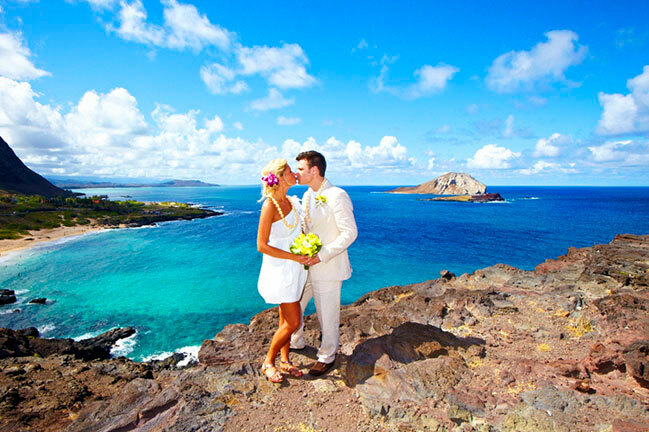 A Hawaii Wedding - Photography FAQ. How many photo do you shoot? For a normal ceremony package coverage, we shoot up to 80-100+ photos for selection, more than enough to give a good variety and selection of images to choose from. Each package specifies the number of Hi-Res JPEG photo files included with your package. You can get more photos after the event by simply upgrading to one of our larger packages. You can get more photos after the event by simply upgrading to one of our larger packages but, we cannot guaranty that the prices and specials you see now will be available after the ceremony. What are Hi-Res JPEG photo files? These are high resolution JPEG files produced after our custom processing of the RAW files which will allow you to make your own high-quality photo prints sizes up 40x60 and larger possible. Simply, these are the largest size files that our professional full-frame cameras can produce. Do we select our own photos? Yes. We create a "WebPhotoGallery" website for viewing and selecting photos within 3 to 7 days after the ceremony. You can use the link to also share with your family and friends. This gallery will be available for (30) days. After you've emailed us your selections, we'll upload your photos to our file transfer service. Follow the directions and your photos will be available for download by you or anyone else you share the link with. The download link will be active for (30) days. Note: If you have opted for all the photos, we'll send you your Final Service Invoice after which, you'll be sent the download link. Can we get our photos on a DVD disk instead of download? Yes. We used to do that in the past before using direct download. Disk and postage is additional. Note: It costs us more labor and time to make and mail prints and we don't want to add that cost to packages especially when, it's possible to electronically download photo files and make your own prints. Simply, it would be ridiculous to have prints included in a package nowadays. Can we go to more locations? Yes. We have a "Photo Tour" option. Note: There are many beaches all over the island but, none are more safe, easier to get to, or better for this purpose. If you want to ask us about another place, we'll consider it. Ditto for ceremony locations. Can we get different style photos than what's shown? No. What you see is what we do. Note: Many websites show you photos that are "lucky" and/or not always, if ever, repeatable, nor do they portray the staples of a ceremony, portrait, and scenic coverage. While we do get awesome shots depending upon the specifics of the ceremony and location, we predominantly show on our website what we do for every wedding, all the time. Can our family and guests take photos and video? We allow photos and video, under our direction during the ceremony as long as, it does not interfere with the performance of our services. But, we do not allow video or photography by others during any of our directed work, the license signing, and during our portrait sessions. If we don't want so many photos of one thing, can we ask the photographer to shoot something else? No. Our photographers are contracted to do a specific job and we actually require them to produce the package coverage we sell. Note: If you don't want many photos of the you, just tell the photographer and he won't shoot it but, you'll get less photos to choose from. With that said, if for example, you want more scenics, a special shot or pose, more family group shots, etc., you can ask the photographer if he has the time to add an extended photo session (i.e. he doesn't have another job to go to). When you receive your photo files, we'll also include a PDF of a copyright release form which allows you to use your photos for making prints and sharing your photos for personal use. We work smartly, efficiently, and quickly making our sessions fun and enjoyable. We kind of do it like a fashion photo shoot if you've ever seen one on TV. Our photographers sequence their shots in a logical progression which enabling us to create a greater variety of shots and more photos quickly and in a lesser amount of time than others. Doing it this way not only saves time, it'll also save you unnecessary extra expense for other vendors waiting for the photographer LOL. A normal package photo coverage is about 15--20 minutes and this is more than enough time to produce our 80-100+ photos for selection. FYI: There's only so much you can do with a couple standing here, looking there, doing this, doing that, LOL etc. before it gets boring and a waste of your time and money. Don't fall for the "hour of photography" gimmick. All of our beach locations are out in the open, there's bright sun, and there's wind but, you'll notice that our photos look great and are very consistent from shot to shot, wedding to wedding, and location to location. We accomplish this by shooting in a style and lighting technique that allows us to create our "look" quickly and consistently at all beach locations, times, and conditions. We're not going into much detail except to say that, look at our photos and if they look good, then good. Finally, unlike most all other websites we shoot RAW files and then expertly process each photo file individually. This adds a significant amount of time to the job (extra 1-2 hrs.) but, we have no interest in giving our clients marginal or crappy photos, even if they're paying far less than then the quality would dictate. FYI: If you don't agree with our interpretation of the RAW files, you can always purchase the RAW files, process them yourself (with appropriate software) and create your own interpretation. Read more here. Do you "fix" and/or "edit" photos? "Yes" because, while it would be really fast and cheaper for us to do, we don't give "dummy" JPEG files coming straight out of the camera. We shoot RAW photo files (see link above) and process each individual photo for our interpretation of the optimum color balance, contrast, and exposure. We do try to remove small distractions, helicopters, planes, birds, and people in the background (if we can), where if it's reasonable. "No" because, we do not get rid of wrinkles, messy hair, blinks, swap heads, remove bandages and tatoos, make people thinner, or remove large distractions from the backgrounds. Why? Simply because, you're not paying a $800+ per hour photography fee. Have you checked the prices of wedding photographers lately? LOL. Note: None of those photos on our website have been "fixed" or "Photoshop-ed" other than using our RAW processing procedure. What is a "Certified "Photographer? Many websites like to use the term "certified" or "licensed" for their photographers, so much that, it's now meaningless. Simply, it's just a word they use to embellish their services. Whatever. A "certified" designation is actually a trademark of the Professional Photographers of America and it's use is prohibited except, on the internet, who cares LOL. Read more here. Note: Our top photographer is a "real" CPP having been awarded that designation a long time ago. "I never look good in photos." How can we tell what's good photography and what isn't? Just look at photos. Not the "lucky" ones they highlight with the beautiful couples running down the beach or flashing a look but, the "real" ones. Look at photos series from as many weddings as possible. Are the horizons straight? Do people look genuinely happy because, the photographer made that LOL? Do people have deep shadows in the eye sockets? Do their eyes look "dead" and dark or do they sparkle? Does the skin look alive and vibrant or is it dull grey? Are the colors of the photos clean, clear, natural and vibrant or do they look flat. How can we tell if what we see is what we'll get? Avoid websites that leaving out the rest of the wedding coverage, those with just a few main page samples. On our website, you'll see lots of weddings, samples from entire weddings and not just great looking "lucky" shots. We show you the progression of our sessions from shot to shot for pretty much the whole wedding. With us, you'll see that what we do is consistent with every wedding, and wedding after wedding. That's what you want... consistency! Read more about photography here. "The bitterness of poor quality lingers long after the sweetness of low cost is forgotten". Read more good advice here.